Sorry to be quiet for so long. Let's get us up to speed. 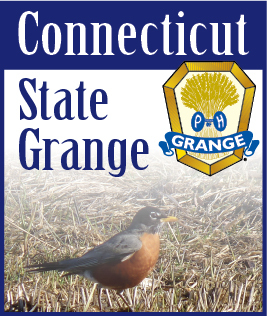 Grange Sunday is coming up on June 8th and the Big E Contest will be judged at that time. If you have anything that could be entered in the Talent Run-Off, please let me know.. The Big E contest is to make something Patriotic. The size is not to exceed 8 x 8 x 8 inches. It could be anything as long as it is Patriotic. It could also be a picture. Use your imagination. The Helmet Project is on-going. We are asking for donations to be sent to the State Grange Central Office (43 Naubuc Ave., Glastonbury, CT 06033) and earmarked for the Helmet Project. A fundraiser that we are having to help support this is going to be held on Celebration Day, July 24. at Cheshire Grange Hall. We will be serving a Meatloaf Dinner from 12 noon to 1:30 P.M. The cost will be $8.00. We will have tickets available at the Pink Sash Meeting. I hope we will have a successful fundraiser. We have to be a little more creative because we don't have the booth at the Agricultural Fair any longer. I hope all of you have bailed your property out and don't have much damage. At least maybe the snow is behind us. Happy Spring!